“SuperSCRIPSIT gives me the advanced features I need, including true proportional spacing for even right and left margins, and automatic pagination.” For professional-looking letters, SuperSCRIPSIT supports underline, bold face, super and subscripts, and multiple column printing. Add VisiCalc® (26-1569, $199) for fast and accurate planning and forecasting. Or choose from a variety of other personal, management or entertainment programs, too. you-and be sure to ask to see our other TRS-80S, too. I may be thinking of any number of other writers, but I’d been under the impression that Asimov stuck with a manual typewriter until the end. The fact he was gushy about macros certainly explains a lot about the vast majority of his works. fluffy: Well, he originally published the Three Laws of Macro Assemblers. Given the amount of spam in my inbox, nobody listened much. I suspect it will be the same with robots. james: I don’t know if it was Apple, but that certainly has always been it’s nickname. I have less hair on my head than he does in those sideburns. Jeez, $2687 in 1983 dollars would be $5600 today. Nope, Asimov used the TRS-80. He talked about it a couple of times in either one of the “Opus” books or a volume of his autobiography. Plus, after his death, there was a used and new SF bookstore in Greenwich Village that acquired the TRS-80 and his desk. They had it as a display in the window. You could buy it. I don’t recall the price tag, but it was beyond my price range! I know the TRS wasn’t apple’s work, but i got undertod apple coined the nickname in the appleII times. They were indeed called “Trash 80s” back in the 80s. 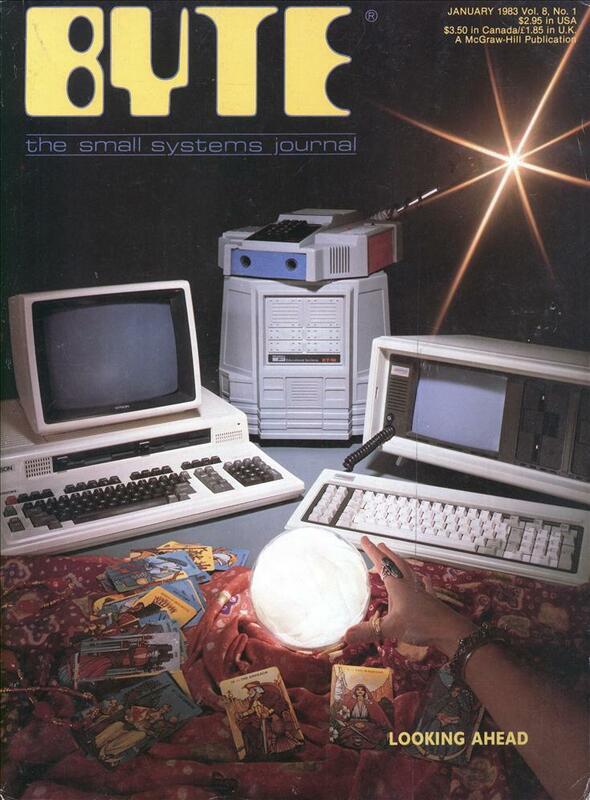 A friend of mine in high school had one which he called a Trash 80 — because he’d upgraded to a Commodore 64. My husband still has his TRS-80 and it works great. For various values of “great”. I think it has 4 whole colors. Every product has a derogatory nickname which is usually a play on its existing name. Such a play-on-words nickname is not rare or unique. At the same time in history, the Apple was referred to as the “Lemon”, as it had its own share of problems. TRaSh-80 came about generally due to the initial quality of the interconnect cable between the Model I and its expansion interface. The signal would disrupt and the computer would freeze. This was fixed by a buffered cable. I just called it TRaSh-80 because, as a Commie-64 user, it seemed like the obvious thing to do. I worked at Radio Shack headquarters and we called them Trash 80s, too. Just not when Management was around. In the mid 70’s to early 80’s I had sideburns just as thick as Isaac’s. Unfortunately in mid ’82 I had surgery which eliminated the side burn on one side……..
James Randi, who knew Asimov personally, said he always used a typewriter. 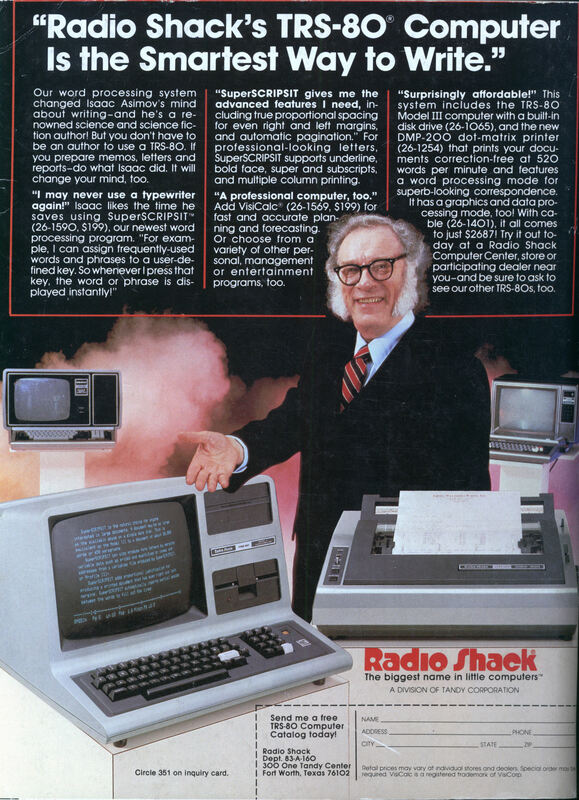 Asimov probably had a TRS-80 around the house primarily because he was the spokesman for it. As long as I know Asimov is one of the first who wrote on computer. Not sure if he used this particular one.